Aprelium Technologies is pleased to announce the availability of Abyss Web Server X1 version 1.2. This version inaugurates the MacOS X and FreeBSD ports. It features also a new anti-crash protection system and introduces the use of patterns to give you more power and flexibility when configuring the web server. It is highly recommended to carefully read the following paragraphs to understand the major changes that became effective in this new version. Despite its well-known and proven stability, we have redesigned the core of Abyss Web Server to make it more robust. This new version is based on the APX architecture. APX, which stands for Anti-crash Protection eXtension, was created, here at Aprelium, to make the server crash-proof. If it happens now that the server causes a critical error and crashes (which is by the way very improbable), a report will be generated if possible and the server is automatically restarted. The downtime in such a case won't exceed 1 second. Abyss Web Server has been ported to MacOS X and FreeBSD. The Macintosh version was designed to take into account all the specificities of MacOS X and to perfectly integrate with this system. 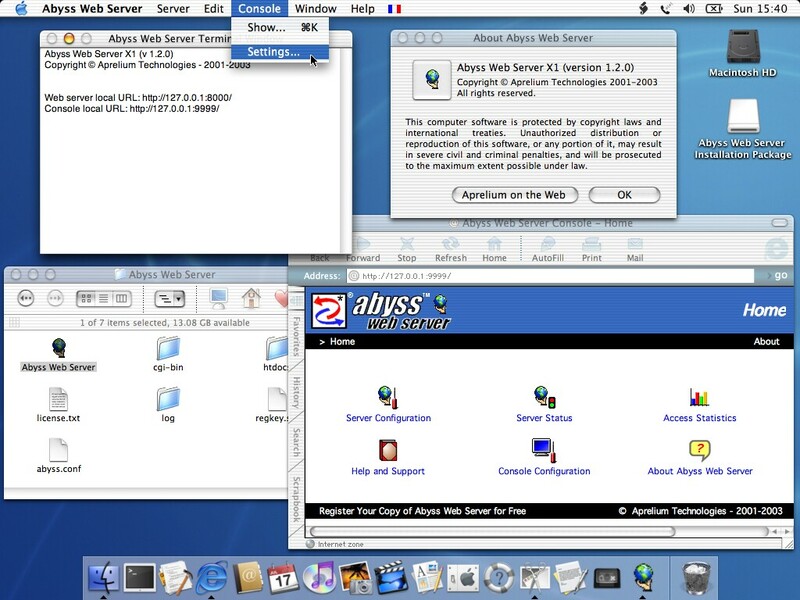 Click on the image below to see a full-size screenshot of Abyss Web Server running on MacOS X. Have you ever wanted to password protect all your JPEG files? The only way to do it with the previous versions of Abyss Web Server was to group all of them in the same directory and to add an access rule for this directory. With the introduction of patterns, password protecting all your JPEG files requires only to add a single access rule that restricts the access to all virtual paths that match with the pattern /*.jpg. Patterns can be used in the Access Rules, CGI Paths, CGI Interpreters extensions lists, and SSI associated extensions. They are very easy to master since they are compatible with the usual MS-DOS patterns and UNIX sh patterns. More information can be found in the updated documentation that ships with Abyss Web Server. Windows users had to separate executables available for downloading from other CGI scripts. This made the configuration of CGI Paths tedious in some extreme cases. With patterns, this is no more the case. Executables are by default downloadable. If they are CGI applications, the user has to explicitly add /*.exe (or a more path restrictive pattern) to the CGI Paths. Besides, adding a CGI Interpreter is now more automated. The server can automatically update the CGI Paths according to the extensions you associate with the interpreter. Visit Upgrading your CGI Paths to know how to change your old CGI Paths settings in order to take advantage of patterns and make executables downloadable by default. The Windows version installer better detects old versions of Abyss Web Server that are on your computer and can even shutdown them for you before starting the installation process. Uninstalling the previous version is also no more required when upgrading. Visit Download Abyss Web Server to get the new release. Installation and upgrading instructions are also provided in this page. Aprelium Technologies thanks John E. Davey (Wisconsin, USA), Luigi Auriemma (Italy) and all the Beta testers of Abyss Web Server X1 version 1.2 for their valuable feedback.